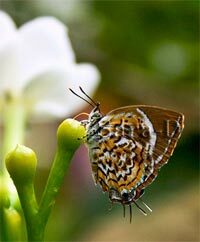 Sri Lanka 244 species of butterflies occur in Sri Lanka, of which 23 are endemics. Their habitats range from the hottest areas in the arid zones to the coolest areas in the forested hills. Some butterflies can be seen all year round while others are seasonal. In size, they range from the large, aptly named Bird-wing butterfly to the tiny, just as aptly named, Grass Jewel. The highest number of species of butterflies occur in the foothills up to 3000 feet elevation. About half a dozen species occur above 4000 feet. Twenty species are strictly confined to the dry zone below 500 feet. There are two major seasons in which the butterfly numbers peak. These correspond to the onset of the south-west monsoon in March-April and the north-east monsoon in September-October. These packages are especially offered for nature lovers and the fitness activists. 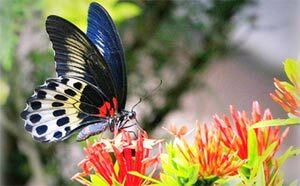 Bird watching and Butterfly watching are interesting packages offered by us which are of high demand. Our Eco Tourism and Explore the Secrets of Tourism packages will bring you a mix of adventure, excitement and fun. Also the Golf Tour packages specially designed for Golf lovers. offers playing in three major golf grounds in Sri Lanka, Colombo, Nuwara Eliya and Kandy. This special selection of group butterfly tours, guided by expert butterfly enthusiasts, has been designed to allow you to enjoy and learn about butterflies in the company of fellow enthusiasts. 10% of the proceeds from each tour is donated to the well-known and highly regarded British conservation charity, Butterfly Conservation, and invested directly in the conservation of British and European butterflies. All of these butterfly tours will focus on butterflies and their habitats, moths (sometimes moth-trapping at night) and, to a lesser extent, other natural history. Nature walk Butterfly Holidays include long-haul butterfly tours to Sri Lanka and South Africa, and tours focusing on European butterflies to the Cévennes and to Normandy in France, the French Pyrenees and the Spanish Pyrenees, the Peleponnese and Mount Parnassos in Greece, the Dolomites in Italy, and the Picos de Europa in Spain. A tour to enjoy the butterflies of the High Atlas Mountains in Morocco is the latest new tour to be added to this specialist programme of butterfly holidays. 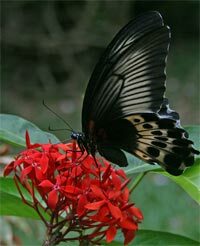 These expert-escorted group butterfly tours offer a wonderful opportunity to visit some of the world's most scenic and appealing butterfly destinations often in the company of one of Butterfly Conservation's staff members or researchers, as well as with a group of like-minded people. As well as a host of butterflies, a wonderful variety of other wildlife is assured, as is a benefit to conservation from your participation.